Just enough to loosen our inhibitions but remain in control is a pretty good amount of booze, so it's a fine line… Balancing on that line is The Tipsy Tourist, a gorgeous video slot by a Betsoft which is designed to work on all devices. Its intro thrusts us into the farcical world of an office worker who, in the midst of his misery, sees a flyer for a Miami vacation and seizes the moment. It hit a bit close to home for me because I could really relate to this guy! The Tipsy Tourist has a freeing spirit which you can't help being a part of – It was I was on a brief holiday too. The Tipsy Tourist is a medium volatility slot with 5 reels and 20 paylines. The standard symbols are: The titular character (sorta reminiscent of Larry the Lounge Lizard), a blonde love interest, air-tickets, starfish and 10-Ace card icons. 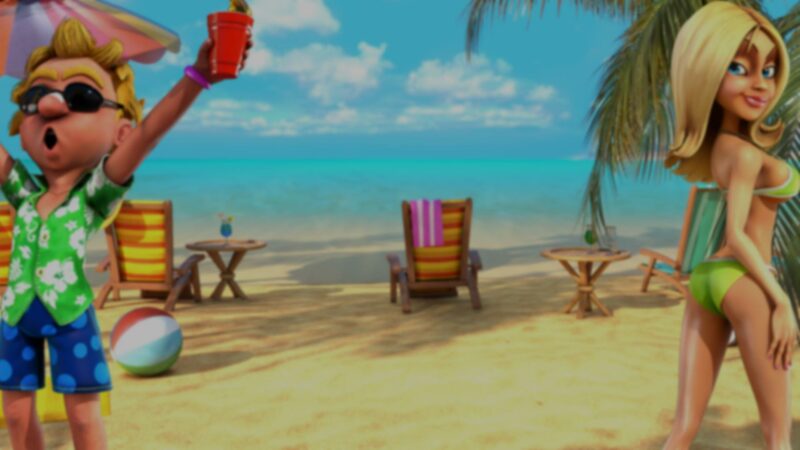 There's a wild symbol which is a beach party wild sign and this can replace everything except the bonus symbols, which are the beach ball (scatter) and red cup. The Controls are embedded into a beach hut which works very well. Along the Bottom is: Choose Coin, Select Lines, Bet Per Line, Bet, Win Display, Max Bet, Spin, Double Up (i.e. Gamble) and Autoplay. Just above that are your Balance and Credit displays, while right at the to are Options (including Turbo) and View Pays. In regular play, after each winning spin, you have the option for a Double Up bet on card color. Choose the right card color and your profits are doubled while an incorrect choice and your profits are lost. 3 or more scatter beach balls earn you 8 Free Spins in which wild symbols are sticky, clinging in place until the Free Spins are over. Best of all, additional free spins can be earned here! 3 or more red cup symbols anywhere on reels 1-3 triggers the Drinking Bonus Round. If you've ever gotten sloshed in college, this will bring back memories. Its a coin toss and the loser has to drink. After either you or your opponent has drunk 3 cups, the game is over. So, your hope is the game goes on a while because the more coin tosses, the bigger your win! It's not unwarranted to say that these animations and graphics could be in a mainstream movie – they're very impressive and amusing. With them though came a concern that the systems I tested The Tipsy Tourist on might come under strain, but it performed admirably on all. The music and sound effects are a fiesta and joy. I'm not sure the powers that be approved of the limbo party I set up in the break room after playing The Tipsy Tourist, but seriously – they brought it on themselves by asking me for the review! It's very hard not to release the party animal within after just a couple of spins. With astounding animation, graphics, music and features, the Tipsy Tourist is escapism at its best. So let's get this party started!